I got two identical spam messages from two friends. Which of us has been hacked? - Ask Leo! I got two identical spam messages from two friends. Which of us has been hacked? It's unlikely that you've been hacked. It's possible that your friends have both been hacked, but this kind of thing can happen without anyone being hacked at all! Leo, I’ve received two emails from two different friends, both of which have the same link in them. Hotmail threw both of them into junk mail area so I was suspicious and didn’t click on the link and deleted them. But I was wondering, have they been hacked? Or have I? Should I warn them or start looking into my own vulnerability? Without looking at the actual message source (meaning the headers that you don’t normally look at) it’s nearly impossible to say. It could be you, but ultimately, I don’t think it’s likely. It could be them. Or, believe it or not, it could be nothing at all. It’s trivial to make email look like it’s “from” someone that it’s not. Nothing has to be hacked for that to happen. 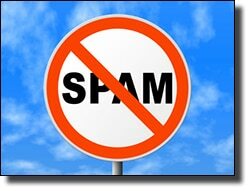 In fact, spammers have been doing that for years. That, in and of itself is so very common, that getting spam from someone you know is pretty meaningless when it comes to understanding what might actually be happening. That you got the same kind of message from two friends is only slightly more interesting. Spammers want to send you messages that you’ll open. One way they do that is to send you messages that look like they come from your friends. And again, no one has to be hacked for that to happen. The spammers just fake the “from” line and send you the email. Now, of course, it is possible that your friends have been hacked. That too, is unfortunately common. It seems less likely in this scenario because you had two friends send you the same message at roughly the same time, which feels more like random spamming. However, if both of your friends’ accounts had been hacked, then yes, the spammer could have found you in your friends’ address books and thus your friends’ accounts could, quite literally, be sending you spam directly. It’s unlikely in my opinion that you’ve been hacked. Normally when an account is hacked, it sends spam. Hacking is rarely related to the spam an account gets after the hack. In fact, the most common symptom of a hack is simply that you can’t log in because the hacker changed your password. But there is a tiny chance, so why not be safe? Change your password. Check out my article, “Email hacked? 7 things you need to do now” to at least get some ideas of the recovery steps you might want to take. Even if your account hasn’t been hacked, it does no harm to stay safe. Why Does My Account Keep Sending Out Spam? - Unfortunately most of this is out of your hands now. There are a few things you can check for, and then you'll have to just get on with your life. How Do I Tell If My Email has Been Hacked? - It can be surprisingly hard to tell if an email account has been hacked, especially when the hackers are covering their tracks. I'll show you a few possible signs. Why Am I Getting Spam from Myself? - Getting spam from yourself? We all do. I'll look at why it happens; what, if anything, you can do about it; and something unlikely but important to check. « Previous post: Is There Room in the World for New Software Engineers? An easy way this could happen is from people forwarding funny messages with everyone’s email addresses exposed. When the hacker gets ahold of the email he knows that the people in the cc list are related in some way and starts sending out spam that looks like it’s from a friend.